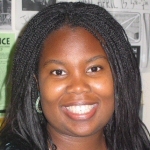 Melissa Stuckey is a member of the Department of History, University of Oregon. She received her Ph.D. in history from Yale University in 2008. Her dissertation, “All Men Up”: Race, Rights, and Power in the All Black Town of Boley, Oklahoma, 1903-1939,” argued that Oklahoma’s all-black towns were critical to the political development of the state’s black migrants. Although Oklahoma did not become the political utopia for African Americans, they used these towns to fight their 1910 disfranchisement. These efforts led to important Supreme Court victories against discriminatory election laws in 1915 and 1939.